G. Lychuk NSC "Institute of farming agriculture of NAAS"
Goal. To evaluate the long-term effects of the traditional organo-mineral system of fertilizer of grain and potato crop rotation on the fertility of drained sod-podzolic soils. 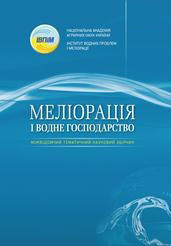 Determine the influence of fertilizers on the activity of Сs137, in particular, to establish the effectiveness of the application of promising polymineral liquid fertilizer «MacroMic» by its foliar application during vegetation from the point of view of increasing yields and decreasing of Сs137 in the yield of plants. Methods. Long-term stationary agrotechnical and interim search field experiments and laboratory analyzes (SSTS 4280: 2004, SSTS 4405: 2005, SS 26489 – 85, SSTS ISO 10703–200). Results. It was established that after 10 years of systematic application of the traditional organo-mineral fertilizer system in the 4-fields grain-potato crop rotation, there was a significant increase in the content of humus, phosphorus and potassium, and significantly decreased the acidity of the drained sod-podzolic soils. Almost 30 years after the Chernobyl catastrophe the level of activity of Сs137 in the soil remained high. One of the main factors determining the mobility of radionuclides is the presence in the soil of organic matter, in particular humus acids, which in large quantities are introduced together with the manure. Humic and fulvic acids are capable of generating complex compounds with radionuclides, which is accompanied by a decrease in the activity of radiocesium. Also, one of the main factors influencing the transition of radiocesium from the soil to plant biomass is the level of plant nutrition by potassium. Under the influence of the complex fertilizer «MacroMic», which contains a significant amount of potassium, the content of this element in grain and straw increased by 14 %. In this case, the tendency to decrease the coefficient of transition of Сs137 from the soil to the plants is observed. The introduction of this fertilizer during vegetation on the leaf surface contributed to a significant increase in the yield of triticale in the version without fertilizers from 1.91 to 2.08 ton per hectar, and against the background of the traditional fertilizer system from 4.40 to 4.60 ton per hectar. Conclusions. In drained sod-podzolic soils, to effectively block the entry of Сs137 into agricultural products, it is necessary to control their physical and chemical properties in order to support the reaction of a soil solution close to neutral, to use higher doses of organic and potash fertilizers, and to use foliar nutrition during vegetation of cereals with soluble fertilizers, which contain potassium. It is also important to reduce the concentration of radiocesium due to increased productivity of crops, which is most achieved when the traditional organomineral fertilizer system is used, due to a radical improvement of all fertility indexes of drained sod-podzolic soils and reduction of radionuclide activity in it. 1. Dynamіka nakopychennya Ss137 u sіlskogospodarskyh kulturah. / Pryster B.S. ta іn. // Naukovyy vіsnyk nacіonalnogo agrarnogo unіversytetu. 2001. S. 51 – 56. 2. Naukovі osnovy agropromyslovogo vyrobnyctva v zonі Polіssya і zahіdnogo regіonu Ukrayiny. Kyyiv: «Urozhay», 2004. 560 s.
3. Dutov O.І. Naukovі osnovy formuvannya agroekosystem na radіoaktyvnyh terytorіyah: avtoref. dys. na zdobuttya nauk. Stupenya dokt. s-h nauk. Kyyiv: 2013. 41 s.
4. Ratoshnyuk V.І. Stan rodyuchostі ta zastosuvannya agromelіoratyvnyh zahodіv na radіoaktyvno zabrudnenyh zemlyah. // Zemlerobstvo. 2004. Vyp. 76. S. 57-64. 5. Yohanon K.Y. Funkcyy organycheskogo veschestva, opredelyayuschye povedenye radyocezyya v systeme pochva-rastenye. // Vіsnyk agrarnoyi nauky. 1997. № 3. S. 15-18. 6. Bondar O.Y. Dostupnost Cs–137 y Sr–90 rastenyyam yz razlychnyh komponentov pochvy. // Pochvovedenye. 2000. № 4. S. 439 – 445. 7. Pryster B.S. Ocenka garantyrovannyh koeffycyentov perehoda radyoaktyvnogo cezyya v selskohozyaystvennye kultury po agrohymycheskym pokazatelyam pochvy: Sb. nauch. tr. UNYYSHR. / Problemy selskohozyaystvennoy radyologyy. Kyev: 1991. S. 132 – 141.